Cell membrane is the ‘line of control’ of the factory of life "the cell". This living structure is responsible for keeping individuality and also acts as a barrier from unwanted intruders. Cell membrane has channels and receptors that allow efficient trafficking and communication. Definition: A thin, semi-permeable that serves as a boundary between the interior of a cell and its extracellular environment and is present in animal and plant cells. In plant cells, a thick wall of cellulose is also present, called as cell wall. Why Plasma membrane is selectively permeable? Gases like O2 and CO2 can diffuse rapidly in solution through membranes. Small compounds like H2O and methane can easily pass through where as sugars, amino acids and charged ions are transported with the help of transport proteins. The size of the molecules which can pass through the plasma membrane is 1-15 A0. The bulk transport of materials across the membrane takes place by exocytosis or endocytosis. This property is responsible for keeping a cell ‘as a cell’, an individual self sustaining unit. Selectively permeable membranes can differentiate and discriminate between substances, allowing some to pass and others not. This trafficking allows cell to maintain an intracellular environment without the interference of outside substances. Cell membrane takes in raw materials from the outside and synthesise complex organic molecules and keeping the products inside and remove waste products of this cellular activities. The pH and volume of the cell is maintained by regulating the concentration of ions inside. Then passive flow of ions into the cell without ATP loss is achieved by creating a concentration gradient across the membrane by regulating ion concentration outside and inside of the cell. Overton (1902) postulated that the plasma membrane is composed of a thin layer of lipids. Robertson (1959) proposed the unit membrane concept. Singer and Nicolson (1972) put forward the fluid mosaic model of membrane structure. It is the most widely accepted model. Cell membrane, what is it made up of ? 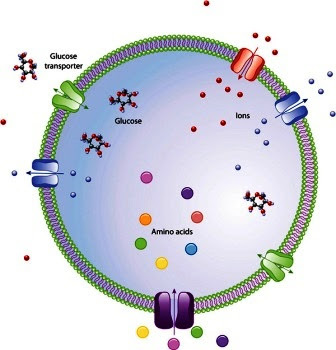 Cell membrane has basically two components: lipids and protein with some amount of carbohydrates. Composition varies in different membranes and that depends on the function. Myelin sheath membrane of nerve cells has high lipid content as its function is to electrically insulate the cell. Mitochondrial inner membrane is the site of oxidative phosphorylation and associated ATP synthesis. It has high protein content as numerous enzymes are involved in the process are located there. Role of Carbohydrates (Glycoproteins) on Cell membrane? Which are the different types of lipids present in the membrane? Three major types are Glycerophospholipids, Sphingolipids, and the sterols. 3) two hydrocarbon fatty acid chains. Major Glycerophospholipids found in membranes are: Phosphatidyl choline, phosphatidyl serine, phosphatidyl inositol, phosphatidyl glycerol and phosphatidyl ethanolamine. Inner mitochondrial membrane is composed of cardiolipin (Diphosphatidylglycerol). The structure is similar to that of Glycero phospholipids except the presence of sphingosine backbone instead of glycerol. Location: abundant in the myelin sheath that surrounds nerve cells and the commonest sphingolipids is sphingomyelin. Glycosphingolipids: here phosphorylated head group is replaced by one or more sugar residues. Galactocerebrosides have a single galactose residue. The gangliosides have many sugar residues with at least one sialic acid residue (N-acetyl neuraminic acid), a constituent of mammalian brain plasma membrane. 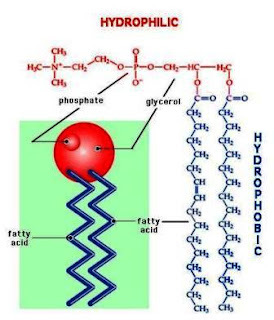 Fatty acid chain, what is it actually? There are two fatty acid chains in glycerophospholipids and one fatty acid chain in Sphingolipids. Generally fatty acid chains are un-branched with even number of C atoms (like palmitate C16). The chain may be fully saturated (no double bonds) or unsaturated (presence of double bonds) (like oleate C18:1 ie 18 C atom and one double bond). 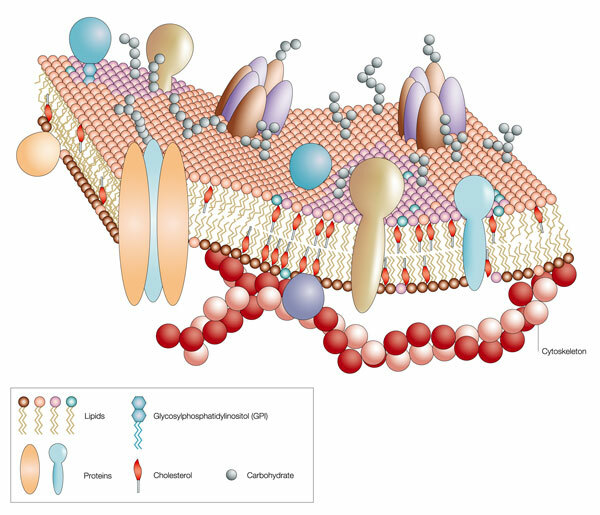 Lipid bi-layer, How it contributes to the function of plasma membrane? 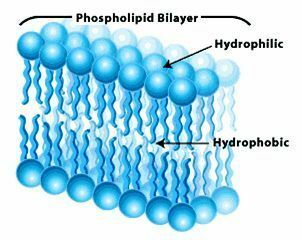 Lipid bi layer has both hydrophilic (H2O loving) and hydrophobic (water hating regions) making it amphipathic or amphiphilic. Take glycerophospholipids to explain this, here glycerol backbone and phophorylated head group are hydrophilic whereas the two fatty acid chains are hydrophobic. In sphingolipids, sugar head group is hydrophilic and rest of the groups are hydrophobic. In cholesterol, except C3 hydroxyl group, the rest portion is hydrophobic. In water, this property of lipid bi-layer contributes to the formation of a stable structure. Phospholipids in aqueous solution forms a stable 2 dimensional lipid layer where hydrophilic head group exposed to the surface and the hydrophobic chains in the interior. The two layers of lipids in the bi-layer are referred as inner and outer leaflets. Different lipid species are distributed asymmetrically between two leaflets in different biological membranes. In plasma membrane of erythrocytes, outer leaflet consists of sphingomyelin and phosphatidylcholine where inner leaflet has phosphatidyl serine and phosphatidyl ethanolamine. What are the interactions that contribute to the formation of lipid bi-layer? Major interaction that helps in self assembly of lipid bi-layers in aqueous solution is hydrophobic effect (also in protein folding). Once the bi-layer structure is formed a) non-covalent interaction and van der walls forces between the hydrocarbon chains b) H bonding between the polar head groups and c) H-bonding between the polar head groups and surrounding water molecules, all contribute to stabilise the bi-layer. Absence of covalent interactions in the lipid bi layer structure may be the reason for this fluidity. Outer and inner leaflet can have rotational or lateral movement. Effect of temperature on fluidity: increasing the temperature convert the gel like consistency to a fluid like manner in a lipid bi-layer. What are the factors that determine membrane fluidity? What about the membrane fluidity, if fatty acid chain length is more? The longer the fatty acid chain, fluidity of the lipid bi layer will decrease as more non covalent interactions are possible between hydrocarbon chains if the chains are longer. What are the effects of double bonds and single bonds in fatty acid chain on membrane fluidity? The more the degree of unstauration, the more the fluidity. The double bonds are more flexible (kink formation) and less rigid compared to single bond or saturated condition. How Cholesterol regulates fluidity of mammalian membranes? At physiological temperature 37oC, increasing the amount of cholesterol in the bi-layer decreases the fluidity of the membrane. Cholesterol has a bulky structure with an elaborate steroid ring system that will interfere with the free lateral movement of fatty acid chains. The more the un-stauration (no. of double bonds) the more the fluidity of the membrane. Increased fatty acid chain length decreases fluidity. Increased amount of cholesterol decrease fluidity at 37oC.